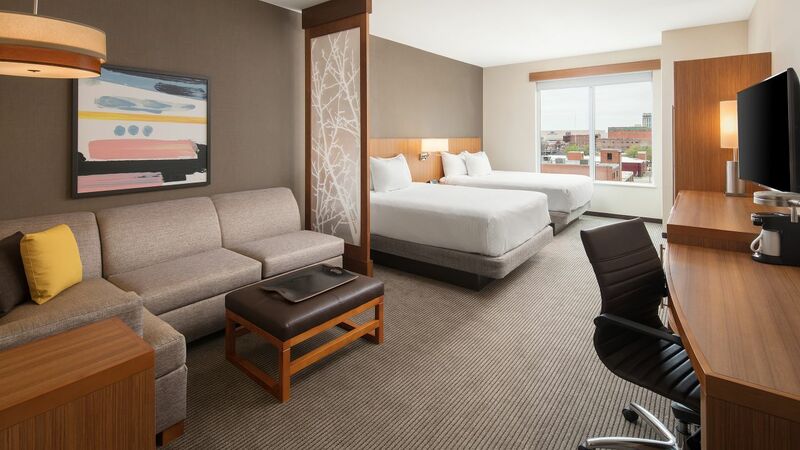 Like the revitalized Bricktown and Deep Deuce District neighborhoods that surround them, the 134 rooms at Hyatt Place Oklahoma City / Bricktown sport a fresh, modern look. 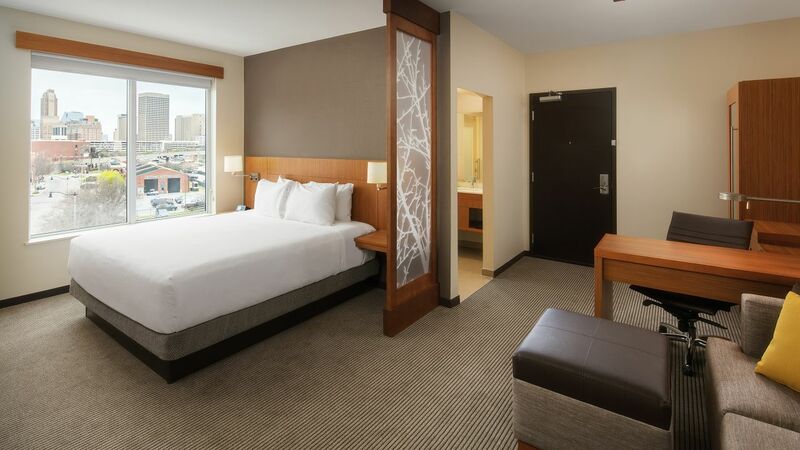 Unfold your laptop on the desk and work from an ergonomic chair or hook the computer up to a Hyatt Plug Panel and stream your own content to the 42” swiveling HDTV.And if you opt for a High Floor room, the curtains open to a panoramic view of the OKC skyline that illuminates the city in full. Accessible features like a roll-in shower enhance this 411-square-foot room, which houses a king bed, a sleek work desk, and a Cozy Corner with sofa-sleeper. Relax in this welcoming 411-square-foot space, where a king bed, desk, and Cozy Corner with sofa-sleeper are supplemented by features like an accessible tub. Up to four adults can comfortably share this 453-square foot room, which has two beds, a Cozy Corner with sofa-sleeper, a desk, and an accessible tub. Gaze at the Oklahoma City skyline from this 411-square-foot room, which includes a king bed, a modern work desk, and a Cozy Corner with L-shaped sofa-sleeper. Watch the sunset or the shifting city lights from this 453-square-foot vantage point, which has a king bed, a work desk, and a Cozy Corner with sofa-sleeper. Make yourself at home in a 411-square-foot room with a modern work desk, a Cozy Corner with sofa-sleeper, and a king Hyatt Grand Bed™ to sprawl out on. Separate living areas keep everyone comfortable in this 453-square-foot space, which has two queen beds, a work desk, and a Cozy Corner with sofa-sleeper.